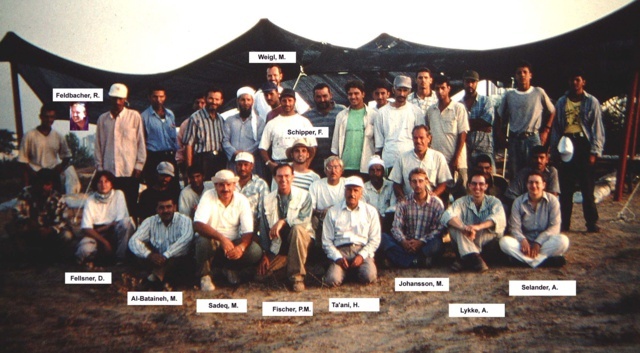 The results of the first season of the renewed excavations at Tell el-cAjjul in 1999 confirmed the high potential for continued archaeological research within the 5000 square metre area, which was fenced on the endangered present summit of the tell (Fischer and Sadeq 2000). Very little could be said at that time about the function of the architecture because of the limited exposed area. The second season at Tell el-cAjjul started on 4 September and finished on 13 October 2000. The joint team included the authors as directors, the surveyor and draughtsperson Muwafaq Al-Bataineh, and the technical archaeologist Hikmat Ta’ani, who also acted as foreman of the local workers. Trench masters were Rainer Feldbacher, Doris Fellsner, Mats Johansson, Anne Lykke, Friedrich Schipper, MA, and Anna Selander and Dr. Michael Weigl. An average of 30 local workers/students were employed. With the kind permission of Dr. Pierre de Miroschedji, the co-director of the nearby Palestinian-French Expedition at Tell es-Sakan, the flotation of our soil samples of 502 litres for later paleobotanical analysis and for the detection of minor pieces of pumice was carried out by Dr. Margareta Tengberg.